1. Preheat the oven to 325°F. To stuff the apples: Wipe the apples, core them, and cut a circle around their equator so they do not burst. Cream the butter, stir in the sugar and ginger and fill this stuffing into the apple cavities. 2. Trim any skin from the ham and all but a thin layer of fat. Score the fat with the point of a knife, cutting almost through to the meat, in a lattice pattern. Put the ham in a casserole and pour over the cider. Cover the pot, bring it to a boil and cook in the oven for 20 minutes. Arrange the apples around the ham and continue cooking until a skewer inserted in the center of the ham is hot to the touch when withdrawn after 30 seconds, 30 to 40 minutes longer. Remove it and set it aside. Test the apples also with the skewer: If they are not tender, leave them and continue cooking until done; if they cook more quickly than the ham, remove them first. 3. Boil the cooking liquid until it begins to caramelize. Let it caramelize for 1 minute then remove from the heat. Mix the brown sugar and ginger in a bowl and stir in the caramelized pan juices to make a very stiff paste. Spread the paste over the ham, return it to the oven and continue cooking until it melts into a rich dark brown glaze, 25 to 35 minutes, basting occasionally. About 10 minutes before the end of cooking, replace the apples in the casserole to reheat them. 4. Transfer the ham and apples to a serving platter and keep warm. Stir the caramel gravy in the pan: If it is very thick, add a few tablespoons of cider and simmer, stirring to melt the caramel. The gravy should be very syrupy. Pour it over the ham and apples. Carve the ham in generous slices at table and serve with gravy and apples. 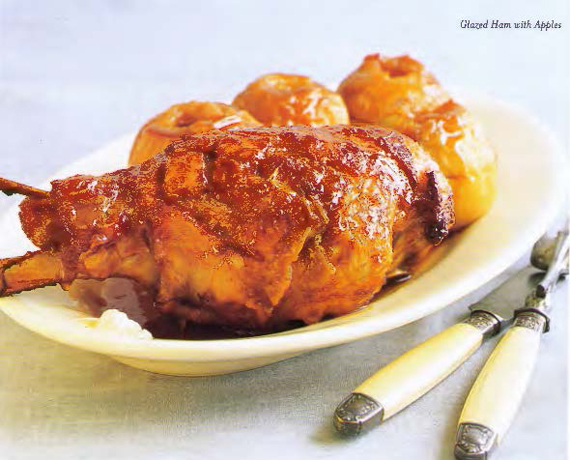 GETTING AHEAD: Glazed ham is delicious cold as well as hot, so making it ahead is no problem. From The Good Cook: 70 Essential Techniques, 250 Step-by-Step Photographs, 350 Recipes by Anne Willan. Stewart, Tabori and Chang, 2004.